Thank you for sharing these 108 days of being Buddha. 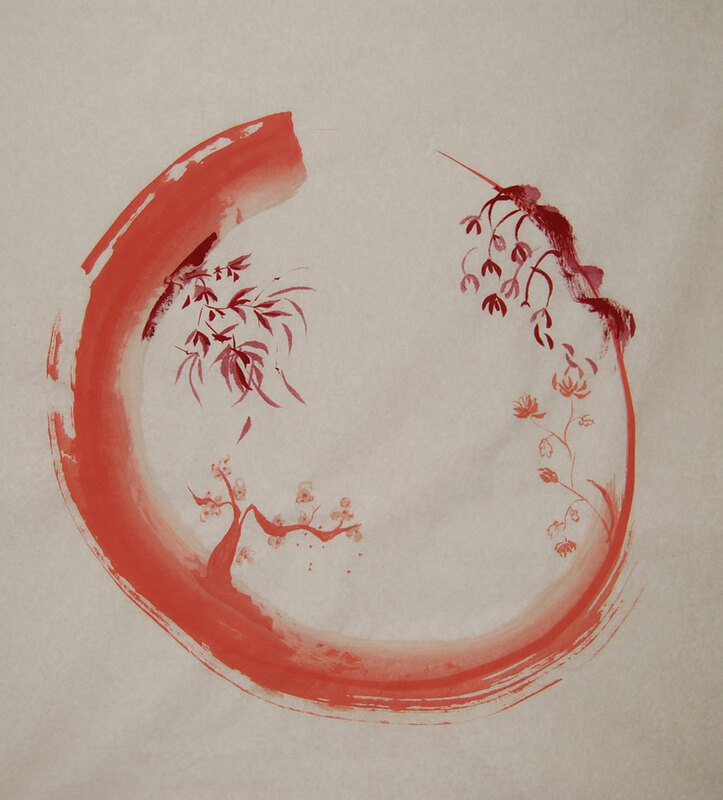 May we all, through our creative love for each other, become enso. 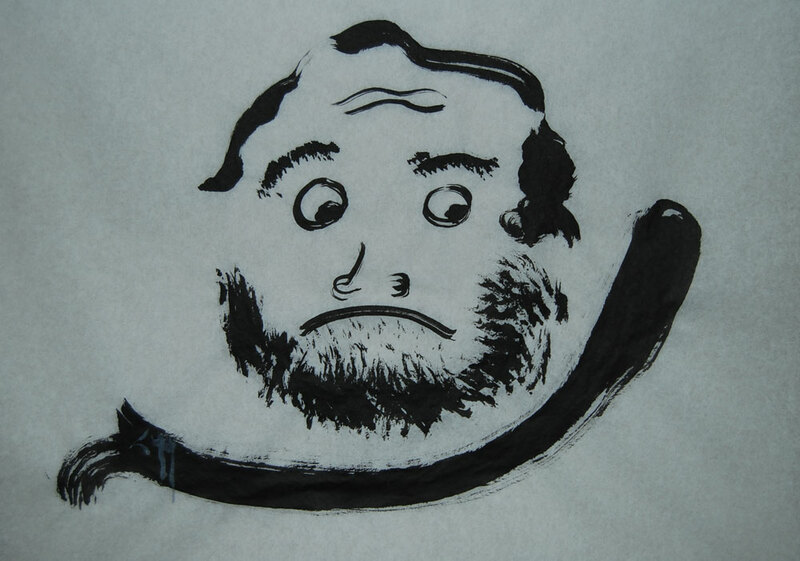 This is a one-stroke Daruma. Kaz Tanahashi is the master of the one-stroke painting. Good teachers are skilled in the one-stroke teaching. 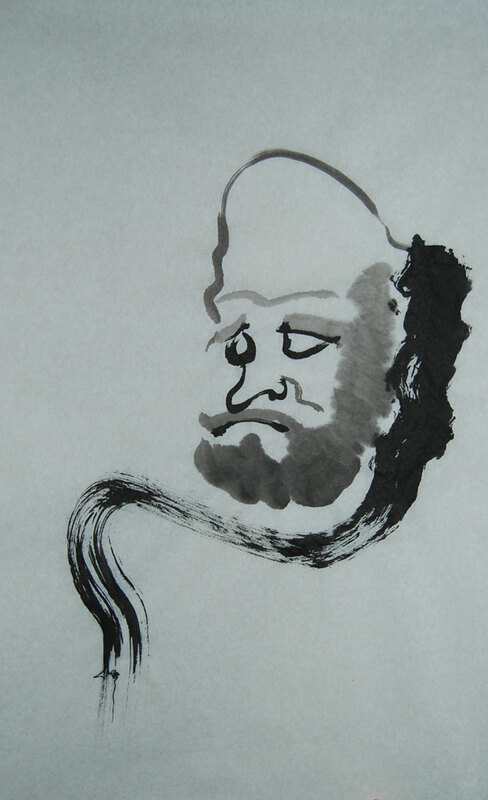 Sohan Gempo (1848-1922) brushed a representation of the seated Bodhidharma with one flourish of his brush (below right). The “flying white” (dry brush technique that leaves white spaces in the stroke) gives the seated Patriarch a feeling that he is dissolving away into the wall he faces. This is Bodhidharma at the end of his practice. Body has fallen away, mind has fallen away. All that remains are the vestiges of form: nose and down-turned mouth. I worry about practising so intensely that my arms and legs fall off. Perhaps I can continue if I hold onto the meager hope that this too is an allegory: a challenge, as Barry of Ox Herding explained in his post Try Try Try, to not stop for 10, 000 years, to keep only what is necessary, and then to let that fade too. Simply try until all that is left is one-stroke. Deiryu Kutsu (1895-1954; Seo & Addiss, The Art of 20th Century Zen) was a follower of Nantenbo and, while much of his art resembles his teacher’s work in its iconoclastic flourish, Deiryu’s Bodhidharma takes on a different tone. Stripped of Nantenbo’s comic, google-eyed tea bowl Daruma, our Patriarch looks world-worn. 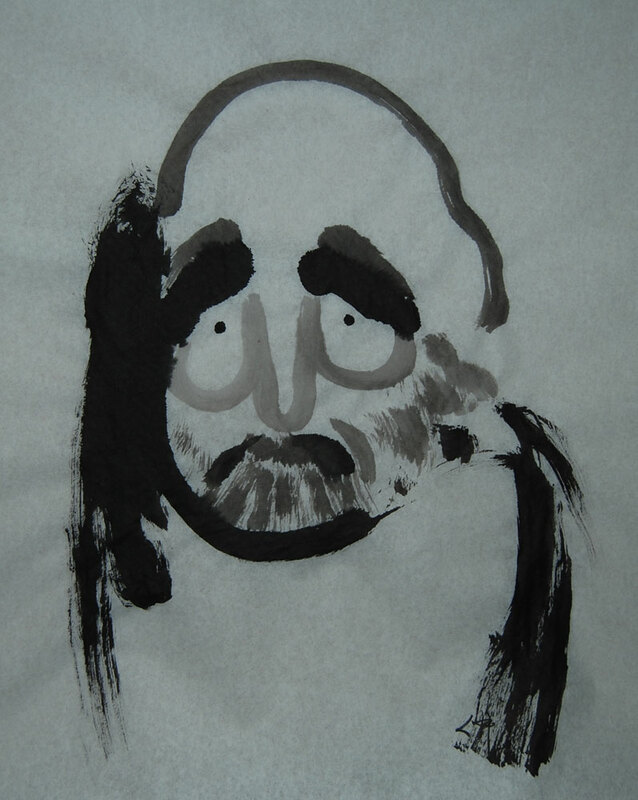 Somber and seeming to look over his shoulder (below), Bodhidharma appears to be questioning our practice – or projecting his compassion for our struggles. I was assisting at a retreat and asked for an interview with one of the monastics. She was a fierce Daruma and on the day of our interview several organizational aspects of the retreat had not been going well. Understandably, I was a bit shaken when she decided we would hold the interview deep the woods surrounding the retreat center. We marched through the forest at double time and eventually came to rest in a copse of birches. “How is your practice?” she asked. I explained that I had hit a difficult spell, that when I sat it seemed like nothing at all, ordinary, as if I was only sitting, waiting for a bus in an empty station. She looked at me blankly. Now really terrified, I launched into a plaintive tale of what my practice had become, all the while watching my poor little mind solidify into an impenetrable rock. Her blank look changed to that intense stare we in the community recognized as an impending verbal kyosaku. She got up, dusted off her robe, and marched back to the hall, leaving me bewildered. Of all the legends about Bodhidharma, the one most likely to stir up the emotions is about the way his disciple Huik’o became Bodhidharma’s student. Huik’o, well-educated in the Tao and Buddhist literature, came to the Patriarch and pleaded to be taken on as his student. Bodhidharma, ever the relentless practitioner himself, refused time and time again. As the story goes, Huik’o stood outside the temple gates in a snowstorm and finally, Bodhidharma came out to ask him what he truly wanted. According to Dumoulin’s interpretation in Zen Buddhism: A history – India and China, this was Bodhidharma’s call for Huik’o to make a decisive, clear commitment to practice. It is a gripping moment in the life of a teacher and student. If we take the legend as fact, it seems blood and limb is often asked of the student and, if so, Zen may well have died out or at best been populated with one-armed practitioners. As an allegory of seeing into the true nature of practice, Huik’o’s action is a clear statement that he was willing to give up what seemed to be an indispensable part of himself for the opportunity to give up something even more fused to the self. He was willing to sacrifice his arm – representing all his previous learning – for a true education: the liberation that comes when his mind is shattered. At some point along the journey there is a moment of softening. This Daruma is a shift from the stern Patriarch and shows a gentling in the old teacher’s features. 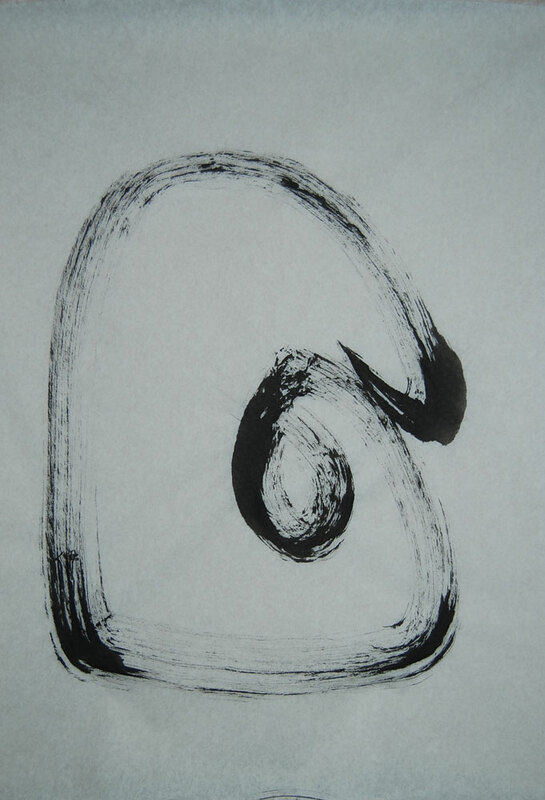 The artist, Zen Master Yuzen (his Daruma is below) was best known for his plum blossom paintings and the soft hues that reflected his calm nature. Although he began to paint from a young age, he was discouraged from continuing because, he was told, it would interfere with his training as a monk. He put aside the ink and stone but, thankfully for us, took it up again later. 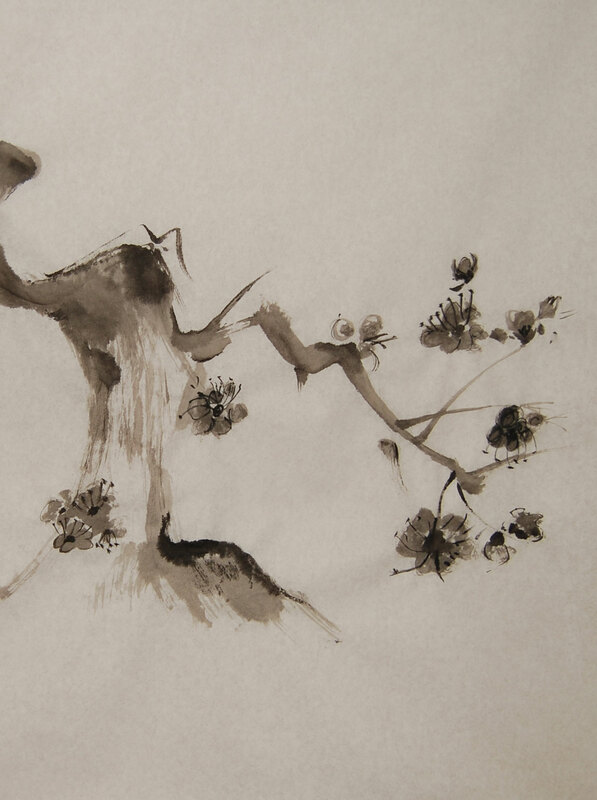 The beauty in Yuzen’s perception of practice is the softness he elicits from ink and paper. Bodhidharma no longer needs to project the harsh unyielding authoritarian teacher (inner or outer) but rather can sit in an empathetic space. The upturn of the inner brows, the open gaze, and cartoon nose invite us to pour our struggles out to him. No. Really? he says. Why struggle against yourself? You are not the enemy. In the path of practice, there was a moment when I felt the shift from hoping practice would make me a better person to realizing practice was only going to bring me face-to-face with this person I am. And, in bearing witness to the reality of who I am, I had to face the harsh, unforgiving, relentlessly self-abusive ways I had developed to deal with myself. Jomon, author of Nothing to Attain, quoted her teacher, Rev Hogen, saying, “Zen is not a self-improvement project.” I really liked reading that – and also feel it’s one of those pronouncements that can too easily slip away from what is really meant. Zen cannot bring about self-improvement; but the practice of zazen is like calling in a housing inspector before the renovations start. To see my own nature, as Yuzen exhorts us to do, is to be that inspector poking around in the rotted beams and taking disciplined measure of the flow of water and electricity. In fact, I’ve had inspectors come through This Olde Farmstead who ended up looking at me with the same kindly expression on Daruma’s face. “Really? No, seriously. I know you’re really attached to these wall switches but they are short-circuiting your lights.” The wall switches went and enlightenment was possible – when I remembered to flip the switch. And that was what practice becomes: not just a process of pointing out the warped planking or the rattling plumbing and restoring them to their true nature. It becomes a process of remembering to flip the new switches so that I can see everything alight. Well, to make a person requires a lot of zazen.